These flashcards will help you learn computer vocabulary, covering both the computers inner functions and its outer parts. MONITOR (DISPLAY SCREEN) Common output device that displays text, graphics, and video as soft copies (copies that can be seen only on screen). MOTHERBOARD A special circuit board in the system unit that contains the CPU, the RAM, and slots available for expansion cards. MOUSE A hardware device used to enter user responses and commands into a computer. NETBOOK A computing device that runs a full-featured operating system but weighs two pounds or less. NETWORK INTERFACE CARD (NIC) An expansion card that enables a computer to connect other computers or to a cable modem to facilitate a high-speed Internet connection. NONIMPACT PRINTER Sprays ink or uses laser beams to make marks on the paper. Ex: inkjet and laser printers. NOTEBOOK COMPUTER A small, compact portable computer. OPERATING SYSTEM (OS) The system software that controls the way in which a computer system functions, including the management of hardware, peripherals, and software. OPTICAL DRIVE A hardware device that uses lasers or light to read from, and maybe even write to, CDs, DVDs, or Blu-ray discs. OPTICAL MOUSE A mouse that uses an internal sensor or laser to control the mouse;s movement. The sensor sends signals to the computer, telling it where to move on the screen. ORGANIC LIGHT-EMITTING DIODE (OLED) DISPLAYS A display that uses organic compounds to produce light when exposed to an electric current. Unlike LCDs, OLEDs do not require a backlight to function and therefore draw less power and have a much thinner display, sometimes as thin as 3 mm. OUTPUT DEVICE A device that sends processed data and information out of a computer in the form of text, pictures, sounds, or audio. PERIPHERAL DEVICE A device such as monitor, printer, or keyboard that connects to the system unit through ports. PIXEL A single point that creates the images on a computer monitor. Pixels are illuminated by an electron beam that passes rapidly back and forth across the back of the screen so that the pixels appear to grow continuously. PLOTTER A large printer that uses a computer-controlled pen to produce oversize pictures that require precise continuous lines to be drawn, such as maps and architectural plans. PORT An interface through which external devices are connected to the computer. POWER SUPPLY A power supply regulates the wall voltage to the voltages required by computer chips; it is housed inside the system unit. PRINTER A common output device that creates tangible or hard copies of text and graphics. PROCESSING Manipulating or organizing data into information. PROJECTOR A device that can project images from computer onto a wall or viewing screen. QWERTY KEYBOARD A keyboard that is distinguished by the first six letter on the top-left row of alphabetical keys on the keyboard. RANDOM ACCESS MEMORY (RAM) Computer's temporary storage space or short-term memory. It is located in a set of chips on the system unit's motherboard. READ-ONLY MEMORY (ROM) A set of memory chips, located on the motherboard, which stores data and instructions that cannot be changed or erased. RESOLUTION The clearness or sharpness of an image, which is controlled by the number of pixels displayed on the screen. RESPONSE TIME The measurement of the time it takes for a pixel to change color; lower response time= smoother moving images appear. S-VIDEO (SUPER VIDEO) A type of technology used to transmit video signals; used on newer LCD monitors, as well as other multimedia devices. SLEEP MODE A low-power mode for electronic devices such as computers that saves electric power consumption and saves your computer settings where you left off. SOLID STATE DRIVE (SSD) A drive that uses the same kind of memory that flash drives use, but can reach data in only a tenth of the time a flash drive requires. SOUND CARD An expansion card that attaches to the motherboard inside the system unit and that enables the computer to produce sounds by providing a connection for the speakers and microphone. SPEAKER An output device for sound. STYLUS A pen-shaped device used to tap or write on touch-sensitive screens. SUPERCOMPUTER A specially designed computer that can perform complex calculations extremely rapidly. SURROUND-SOUND SPEAKER Speaker systems set up in such a way that they surround an entire area with sound. 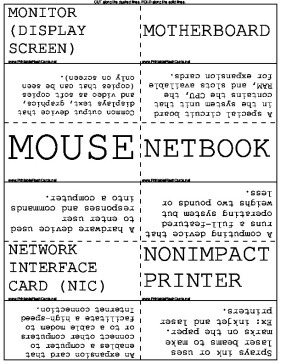 SYSTEM SOFTWARE Set of programs that enables a computer's hardware devices and application software to work together; it includes the operating system and utility programs. SYSTEM UNIT The metal or plastic case that holds all the physical parts of the computer together. TABLET PC A notebook computer designed specifically to work with handwriting recognition technology. TERABYTE (TB) 1,099,511,627,776 bytes or 2^40 bytes (approximately 1 trillion bytes). THERMAL PRINTER A printer that works either by melting wax-based ink onto ordinary paper, or by burning dots onto specially coated paper. TOUCH SCREEN A type of monitor that accepts input from a user touching the screen. TOUCH PAD A small, touch-sensitive screen at the base of a notebook keyboard. TRACKBALL MOUSE A mouse with a rollerball on top instead of on the bottom. TRACKPOINT DEVICE A small, joystick-like nub that enables you move the cursor with the tip of your finger. UNIVERSAL SERIAL BUS (USB) PORT A port that can connect a wide variety of peripheral devices to the computer, including keyboards, printers, mice, etc. VIDEO CARD An expansion card that is installed inside a system unit to translate binary data into the images viewed on the monitor. VIDEO GRAPHICS ARRAY (VGA) A port which a CRT monitor connects. VIEWING ANGLE Measured in degrees, this tells how far you can move to the side of the monitor before the image quality degrades to unacceptable levels. VOLATILE STORAGE Temporary storage, such as in RAM. When the power is off, the data in volatile storage is cleared out. WARM BOOT The process of restarting the system while it's powered on. WEBCAM A small camera that sits on top os a computer monitor or is built into a notebook computer. ALL-IN-ONE COMPUTER a desktop system unit that houses the computer's processor, memory, and monitor in a single unit. ALL-IN-ONE PRINTER combines the functions of a printer, scanner, copier, and fax machine. APPLICATION SOFTWARE The set of programs that run on a computer to help a user carry out tasks such as word processing, sending e-mail, balancing a budget, creating, presentations, editing photos, taking online course, and playing games. ASPECT RATIO the width-to-height proportion of a monitor. BINARY DIGIT (BIT) a digit that corresponds to the on and off states of a computer's switches. A bit contains value of either 0 or 1. BINARY LANGUAGE The language computers use to process data into information, consisting of only the values 0 and 1. BLU-RAY DISC (BD) A method of optical storage for digital data, developed for storing high-def media. It has the largest storage capacity of all optical storage options. BLUETOOTH Wireless transmission standard that facilitates the connection of electronic computing devices. BRIGHTNESS A measure of the greatest amount of light showing when a monitor is displaying pure white; measured as candles per square meter (cd/m^2) or nits. COMPACT DISC (CD) A method of optical storage for digital data; originally developed for storing digital audio. CENTRAL PROCESSING UNIT (CPU) The part of the system unit of a computer that is responsible for data processing; largest/most important chip in the computer; controls all the functions performed by the computer's other components and processes all the commands issued to it by software instructions. COLD BOOT The process of starting a computer from a powered-down or off state. COMPUTER A data-processing device that gathers, processes, outputs, and stores digital data and information. CONNECTIVITY PORT A port that enables the computer (or other device) to be connected to other devices or systems such as networks, modems, and the Internet. CONTRAST RATIO A measure of the difference in light intensity between the brightest white and the darkest black colors that a monitor can produce. If the contrast ratio is too low, colors tend to fade when the brightness is adjusted to high or low settings. CURSOR CONTROL KEY A set of controls on standard keyboards that movies the cursor; also known as an arrow key. DATA Numbers, words, pictures, or sounds that represent facts, figures, or ideas. DESKTOP COMPUTER A computer that is intended for a use at a single location. A desktop computer consists of case that houses the main components of the computer, plus peripheral devices. DIGITAL VIDEO DISC (DVD) A method of optical storage for digital data that has greater storage capacity than compact discs. DIGITAL VIDEO INTERFACE (DVI) Video interface technology that newer LCD monitors, as well as other multimedia devices such as televisions, DVD players, and projectors, use to connect to a PC. DRIVE BAY A special shelf inside a computer case that is designed to hold storage devices. EMBEDDED COMPUTER A specially designed computer chip that resides inside another device, such as a car. These self-contained computer devices have their own programming and typically neither receive input from users nor interact with other systems. ERGONOMICS How a user sets up his or her computer and other equipment to minimize risk of injury or discomfort. ETHERNET PORT A port that is slightly larger than a standard phone jack and transfers data at speeds of up to 10,000 Mbps; used to connect computer to a DSL or cable modem or a network. EXPANSION CARD (ADAPTER CARD) A circuit board with specific functions that augment the computer's basic functions and provide connections to other devices; ex: video card and sound card. EXTERNAL HARD DRIVE A hard drive that is enclosed in a protective case to make it portable. Connected through a data transfer cable. FIREWIRE 400 An interface port that transfers data at 400 Mbps. FIREWIRE 800 One of the fastest ports available, moving data at 800 Mbps. FLASH DRIVE (USB, JUMP DRIVE, THUMB DRIVE) A drive that plugs into a universal serial bus (USB) port on a computer and stores data digitally. FLAT-PANEL MONITOR A type of monitor that is lighter and more energy-efficient than a CRT monitor; often used with portable computers such as notebooks. GIGABYTE (GB) About a billion bytes. GIGAHERTZ (GHZ) One billion hertz. HARD DRIVE A device that holds all permanently stored programs and data; can be located inside the system unit or attached to the system unit via a USB port. HARDWARE Any part of the computer you can physically touch. HIBERNATE A power-management mode that saves the current state of the current system to the computer's hard drive. HIGH-DEFINITION MULTIMEDIA INTERFACE (HDMI) A compact audio-video interface standard that carries both high-definition video and uncompressed digital audio. IMPACT PRINTER Has tiny hammer-like keys that strike the paper through an inked ribbon. ex: dot-matrix printer. INFORMATION Data that has been organized or presented in a meaningful fashion. INKJET PRINTER Sprays tiny drops of ink onto paper. INPUT DEVICE Hardware device used to enter, or input, data and instructions into a computer. Ex: keyboards and mice. INTERNAL HARD DRIVE A hard drive that is installed inside the system unit. KEYBOARD A hardware device used to enter typed data and commands into a computer. KILOBYTE (KB) A unit of computer storage equal to approximately one thousand bytes. LASER PRINTER A nonimpact printer known for quick and quiet production and high-quality printouts. LEGACY TECHNOLOGY Comprises computing devices, software, or peripherals that use techniques, parts, and methods from an earlier time that are no longer popular. LIQUID CRYSTAL DISPLAY (LCD) The technology used in flat-panel computer monitors. MAINFRAME A large, expensive computer that supports hundreds or thousands of users simultaneously and executes many different programs at the same time. MEGABYTE (MG) A unit a computer storage equal to approximately 1 million bytes. MEGAHERTZ (MHZ) A measure of processing speed equal to 1 million hertz. MICROPHONE (MIC) A device that allows you to capture sound waves, such as those created by your voice, and transfer them to digital format on your computer. MODEM CARD An expansion card that provides the translate digital data into an analog signal and back again. MODEM PORT A port that uses a traditional telephone signal to connect a computer to the Internet.